With three straight Southeastern Conference victories — two in a row on the road and two in a row against ranked opponents — No. 14 Florida Gators football is riding high as it travels North to take on the SEC East rival Vanderbilt Commodores on Saturday. Thought Vanderbilt has three wins already on the season, none are particularly impressive, and it’s dropped its last two games to SEC East opponents by a combined 51 points. What will go down on Saturday afternoon? 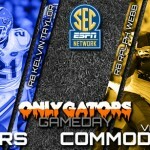 Let’s take a look at what you need to know and how you can watch Florida-Vanderbilt. Just one week after being underdogs at home, the Gators hit the road as touchdown favorites against a Commodores team that gave No. 2 Georgia some fits in the first half seven days ago. Vanderbilt has already picked up three wins on the season, but it’s most impressive performance was in a five-point road loss to Notre Dame in Week 3. Since then, it has lost by 23 at home to South Carolina and 28 on the road against the Dawgs. Unlike most weeks where I hem and haw over whether Florida is a worthy pick against the spread, this one is a no-brainer for me. The ‘Dores may wind up testing the Gators early in the game — getting up for an 11 a.m. local kickoff is difficult for anyone — but ultimately Florida’s strong running game, swarming defense and improved special teams will clearly win out. With the early start, I don’t expect UF to post a high total in this game, and with it likely limiting Vandy to only a couple scores on the day, I like this to stay under the number. » Florida is 39-10-2 all-time against Vanderbilt with an 18-7-1 series mark in Nashville. The Gators have won 26 of the last 27 meetings against the Commodores and have not lost in Nashville since 1988, winning 13 straight. » UF improved to 2-0 against ranked opponents with its win over LSU last week, but it’s just 6-9 against ranked teams since 2015 and 11-22 since 2011. The victory was Florida first over a top-five team in three years and the first time it beat ranked opponents in consecutive weeks since 2008. » The Gators have a 118-29 scoring margin in the first half this season. » Florida is No. 2 nationally in turnovers with 17, the same number it acquired during the entire 2017 season. It has converted those turnovers into 50 points. UF is also second nationally in turnover margin (+11). » The Gators are 3-0 when they score first, 5-0 entering the fourth quarter with a lead, 4-0 when outrushing their opponents and 2-0 when allowing fewer than 300 yards to an opponent this season. » Florida is fourth nationally in red zone touchdown percentage (.364) with opponents scoring just four in 11 trips. The Gators are also sixth in passing defense (148.5), third in passing efficiency defense (96.1), eighth in scoring defense (14.8) and third in total sacks (20). » Florida will wear white jerseys, white pants and orange helmets. 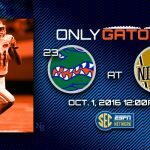 » The Gators have scored in 378 consecutive games, an NCAA record. I agree that the O/U is a high number, but I’m shying away from taking this one on the -7 because I don’t know which Vandy team will show: the one SC blew away at Vandy, or the one who pushed Notre Dame on the road. I agree that the early start is an issue. I just hope we win but won’t be surprised if we don’t cover. But I hope you’re right. lol . . I guess I better keep my day job. . that’s why they call it gambling!